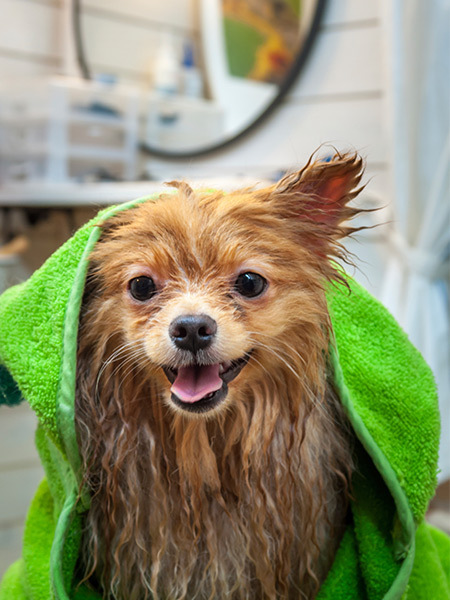 Prices for dog bathing and dog grooming packages are based on breed, condition of coat and time taken to complete the service. While we can do our best to provide an approximate price range over the phone, you’ll get the most accurate quote if we can assess your pet in person. We reserve the right to muzzle any uncontrollable or bite happy dog. The grooming area is considered a sensitive area and we will do whatever is necessary to keep safety as priority. Any uncontrollable guest will need to be sent home and the full charge of the grooming will still apply. We will not force any guest into a grooming service. All guests must have their vaccination records prior to the grooming appointment. All guests must have their Rabies vaccine current. Any guest suitable for Day Care must qualify for doggy day care. Guests must be at least 4 months old, spayed or neutered (if over six months) and current on vaccinations for Rabies, Distemper, Parvovirus and Bordetella (canine cough). Copies of vaccination records are required during the evaluation process. Guests must be in good health, flea/tick free, friendly to all dogs, and generally love to play. NOTE: We do not breed discriminate, we welcome all breeds. Every daycare dog must pass our temperament test, be up to date on all vaccines, flea/tick free and have all the proper paperwork filled out. All grooming clients must be up to to date on their rabies vaccine.